21,88 Original Zf Automatic Transmission Oil Pan Filter Incl Oil BMW Zf Ga6hp26z. The description of this item has been automatically translated. Original ZF oil pan + 8L ZF oil +. Original ZF oil pan gasket and filter for transmission type. 8 x 1L original ZF lifeguard 6 gear oil. Here qualtitativ acquire quality product from OEM ZF Transmission GmbH "Made in Germany"!! It is recommended all 60,000 km transmission oil and filter replacement. Even in so-called Lifetime fillings, these are technically proven nonsense. Finally makes a one properly serviced automatic / DSG gearbox for a problem-free running, and of course for the value of your vehicle. To ensure that you get the right oil pan please notify us the VIN of your BMW with. To Ensure did you get the right oil pan please let us know the VIN (chassis number). OE NUMBERS / COMPARE NUMBER. 24 11 7 571 227 BMW. 24 11 7 522 923 BMW. 24 11 7 519-359 BMW. 24 11 0 403-404 BMW. 24 15 2 333 903 BMW. The used oil regulation, we are obliged to take back following used oil for free: Vebrennungsmotorenöle, gear oils, oil filters and changing the oil regularly oily waste. Our acceptance is: Aleks24 LTD. Alternatively, you can send the used oil to our receiving Office. Please ensure in this case for a suitable transport packaging and a Dist. Please note that special transport conditions can apply to waste oil. We also point out that our adoption Center has a facility that allows professionally perform the oil change. If you are a commercial consumer, we point out that we third party can use you to fulfill the obligations of our adoption. We suggest that our replacement parts high Standards of quality. New and original packaging (OVP). Fits in the following vehicles - see table below. Please make sure that your vehicle below is listed in the car list and note please the underlying notes thereto. We also send to packing stations! Products, parts, stock and order no. Serve for comparison purposes only and are not original designations. The naming of names, trademarks or brand names is done only for the purpose of classification of our products. 24 11 7 571 227. 24 11 7 522 923. 24 11 7 519 359. 24 11 0 403 404. 24 15 2 333 903. 0501 216 243 b 0501216243b. Getriebefilter Ölfilter BMW Land Rover Aston Marti. 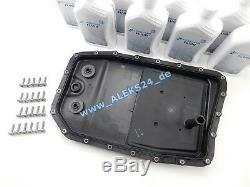 Transmission oil pan kit trans fluid Oelwanne. Life Guard Fluid 6 Lifeguardfluid 6. 3 er E90 E91 E92 5 er E60 E61 6 er E63 E64. 7 er E65 E66 E67 F01 F02 F03 X3 E83 X5 E70 X6 E71. 3003250000 300 325 0000 V20-0585 V20-2088. SG1065 0825018 300 325 0005 3003250005. The item "21,88 Original Zf Automatic Transmission Oil Pan Filter Incl Oil BMW Zf Ga6hp26z" is in sale since Saturday, March 30, 2019. This item is in the category "Vehicle Parts & Accessories\Car Parts\Transmission & Drivetrain\Gearboxes & Gearbox Parts". The seller is "www_aleks24_de" and is located in Höchstadt. This item can be shipped to all countries in Europe.